This novel scooped me up, embraced me, made me cry, ripped my heart out a little, and then sat me down gently with a pat on the back. Protected by Claire Zorn was everything you can imagine it would be and more. 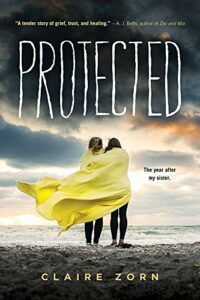 Protected followed the story of Hannah as she copes with life after the sudden and tragic death of her sister Katie. Not only is she trying to deal with a new found freedom that doesn’t involve any school bullying, no one will come near her since Katie died, but she also has to juggle with her loss of memory, her deteriorating family, and her mixed emotions about her own life and who she wants to be. Zorn reminds me a lot of Sarah Dessen in her writing style. She has this uncanny grasp of teenage life and emotions. Obviously she was one at a point, but the way she writes out the emotions and their personalities is so realistic and helps me relate to them because I feel like I understand them more. I loved Hannah as a whole. She was so raw and emotional, but also brave without even realizing it. I enjoyed the way supporting characters played a big role, but in a subtle and non-compromising way. I feel like this story would not have been as powerful without those background voices. Protected is ripped down to the bone of emotions that will leave readers raw and asking for more. I found myself wanting to know more of Hannah’s story. This novel didn’t leave on a cliffhanger, but left you showing her continuing with life and I love that. It’s reality. Life goes on. Hannah’s story is so much longer than these pages, but we got to see a big glimpse of it and I wish she were real so I could give her a hug. Claire Zorn wrote me a new friend and that level of connection with a book is hard to accomplish. A fantastic piece of work from Zorn that anyone who has been through tragedy or any kind of crisis should pick up. It may not be a feel good book throughout, but it leaves you feeling good at the end. Protected by Claire Zorn is available October 3, 2018 on Amazon, Barnes and Noble, and check your local bookstore. Also make sure to add it to your To Reads list on Goodreads and leave feedback for the author when you are finished. You can check out more from author Claire Zorn on her website here!